We Are Chester writer Tori Erskine heads over the border to check out a brand new musical from Theatr Clwyd in Mold, working in partnership with Headlong, Bristol Old Vic and Rose Theatre Kingston. Read on to find out what she thinks of Junkyard, which is directed by Jeremy Herrin. Admittedly it’s been a while since I attended the theatre, and Junkyard was certainly the perfect show to welcome me back into the world of the arts. From looking at the programme you’re already assured that it is going to be a special event, Jack Thorne’s (book and lyrics) impressive resume includes Harry Potter and the Cursed Child and BAFTAs for This Is England ’88 and ‘90. As we take our seats, it’s impossible to miss the set, a giant overbearing wooden structure that looks unmistakably like a playground. For music fans, the production designer Chiara Stephenson’s designs include the amazing Sigur Ros’s Europe and US tours. Don’t be fooled into thinking that you’re in store for a simple ‘Hard Knock Life’ kind of play. Junkyard is edgy, anarchic and also one of the funniest performances I have seen in a long time. The story sees a group of misfit teenagers coming together to build a playground, what sounds like a simplistic story, holds a much more deeper emotional plot. From Feisty Fiz (Erin Doherty) to the dry humour of Ginger (Josef Davies), you can undoubtedly see the rapport and chemistry between the characters on stage. Theatr Clwyd was the perfect setting for the production as the cast broke the fourth wall which made the performance a lot more intimate and personal. We felt empathy with the characters as we see their passion for the task that they had been set to do. As a member of the audience they even helped me form an emotional attachment to their playground! The music production undoubtedly needs to be commended, the simple but effective, guitar and drums were just as compelling, if not better at setting the scene as a large orchestra, and complimented the cast’s harmonies perfectly. The music itself comes from Oscar-winner Stephen Warbeck, who won Best Original Score for Shakespeare in Love in 1988. The street drumming was a great addition to the set, keeping in tone with the rough and rugged setting of the play. The songs accompanied the storytelling and a few days later This is a spider, this is the ship was still happily stuck in my brain, as me and my other half sat humming it on the sofa. One thing I really enjoyed about the production was the design. The cast utilised the set, climbing over it and protecting it, making the playground almost a symbolic religious figure. Without spoiling the ending, Junkyard is a heartwarming experience where we see young people appreciating their abilities and believing in themselves, without being just a clichéd story of personal discovery. 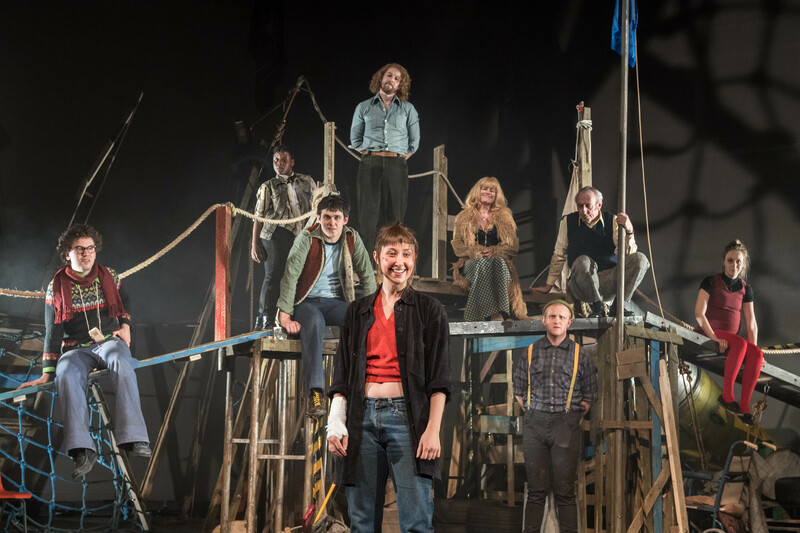 Junkyard is showing in the Anthony Hopkins Theatre at Theatr Clwyd until 15 April.